The study published today by University of Cambridge scientists working with colleagues in India and the USA is the first to visualise the movement of gases at one million degrees in coronal loops – solar structures that are rooted at both ends and extend out from active regions of the Sun. 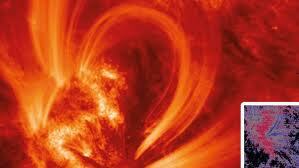 Active regions are the ‘cradle’ for explosive energy releases such as solar flares and coronal mass ejections (CMEs). The observation will help scientists understand what is considered to be one of the most challenging issues in astrophysics – how solar structures are heated and maintained in the upper solar atmosphere. Extreme solar activity can lead to severe space storms that interfere with satellite communications and damage electric power transmission grids on Earth. Solar activity is cyclical, with the next maximum forecast to occur around May 2013, and severe space weather is now listed very high on the UK’s 2012 National Risk Register of Civil Emergencies. Based on observations from the Hinode satellite (a joint Japanese, NASA, European Space Agency and UK project), the new findings provide the first evidence of plasma upflows travelling at around 20 km per second in the one million degree active region loops. The scientists suggest that the upflow of gases is probably the result of “impulsive heating” close to the footpoint regions of the loops. “Active regions are now occurring frequently across the Sun. We have a really great opportunity to study them with solar spacecraft, such as Hinode and the Solar Dynamics Observatory (SDO),” said co-author Dr Helen Mason from the University of Cambridge’s Department of Applied Mathematics and Theoretical Physics. “Probing the heating of the Sun’s active region loops can help us to better understand the physical mechanisms for more energetic events which can impinge on the Earth’s environment.” Previous ultraviolet images of the Sun taken by NASA’s SDO have shown large loops of hot gas guided by the Sun’s magnetic field and rooted near sunspots. Despite such remarkable developments in the observations and theory of active regions over the past few decades, the question remained as to how solar plasma is heated and rises up into the loops in the first place. Now, the new research provides the first visualisation of plasma flow by showing the movement of gases within the loop as ‘blueshifts’ in diagnostic images using the extreme ultraviolet imaging spectrometer (EIS) on the Hinode satellite. Spectral lines produced by the spectrometer act like ‘fingerprints’ or the ‘bar code’ in a supermarket – the lines identify the multitude of elements and ions within the loop and shifts in the position of the lines provide information on the motion of the plasma. Although the Sun is composed mainly of hydrogen and helium, there are also other trace elements, such as oxygen and iron, in the hot ionised gas within the loops. The scientists suggest that the gas movement is caused by a process of “chromospheric evaporation” in which “impulsive heating” on a small scale can result in the heating of the solar active regions but on a larger scale can lead to huge explosions, such as solar flares or coronal mass ejections. “It is believed that magnetic energy builds up in an active region as the magnetic field becomes distorted, for example by motions below the surface of the Sun dragging the magnetic fields around,” explained Mason, whose research is partially funded by the UK’s Science and Technology Facilities Council (STFC). “Sometimes magnetic flux can emerge or submerge and affect the overlying magnetic field. We believe that solar plasma surges upwards when impulsive heating results from magnetic reconnection which occurs either in the loops or close to the Sun’s surface. These disruptions are sometimes relatively gentle but can also be catastrophic.” Commenting on the newly published study, Professor Richard Harrison MBE, Head of Space Physics and Chief Scientist at the STFC Rutherford Appleton Laboratory, said: “The Sun governs the environment in which we live and it is the so-called solar active regions that drive extreme conditions leading to the explosive flares and the huge eruptions; understanding these active regions is absolutely critical for the study of what we now call space weather. The work published by in this paper is a key element of that work, applying innovative analyses to the observations from the UK-led Hinode/EIS instrument.” The researchers hope that a better understanding of active regions might one day help scientists to identify the magnetic field structures that lead to explosive solar energy releases and use this as a means for predicting when such events will occur. The study is published today in Astrophysical Journal Letters.